Hybrid Sessions is a new monthly series at Hybernská 4, the next step after last year’s Sólové series in Skautský Institut. On the last Wednesday of each month we will feature an improvised duo set with two musicians coming from different backgrounds to form a new constellation. Afterwards, we will host a jam session open to all musicians, regardless of background. We want to create an open environment where musicians feel free to be creative in the moment, nothing is predetermined and the only expectation is a high level of presence. A basic back line will be provided. The first Hybrid Session is 27 February and will open with Marcel Bárta and Ivan Palacký. Marcel of course is an incredible musician and Ivan is a pioneer of free improvisation in CZ. Marcel Bárta is one of the most influential Czech jazz musicians. He is a member of the bands Vertigo and Muff, which he also composes for. Besides these two bands he has been collaborating with numerous Czech musicians of different genres (Zuzana Dumková, Jaromír Honzák, David Dorůžka, -123 minut, PIO etc). 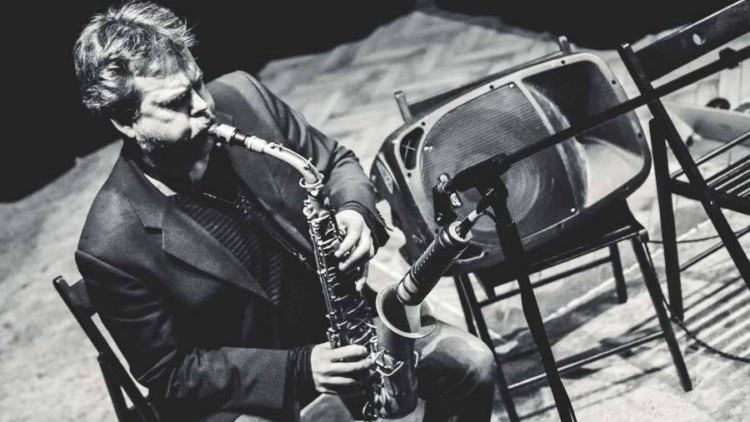 Marcel is also a teacher of the Conservatory of Jaroslav Ježek and the Academy of Music in Prague. In last few years Marcel has been working with experimental theatre Farma v Jeskyni and he has been creating visual art often exhibited or used for CD covers or posters. Ivan Palacky has (since the 80s and beginning of 90s) played with various groups and taken part in several music projects. …was a member of the guitar/doublebass/bassoon group„Slede, zive slede“(Herring, live herring) – and currently performs in a audiovisual duo „Koberce, zaclony/Carpets, Curtains“ (w. Filip Cenek). …is an enthusiastic member of Prague Improvisation Orchestra. …is a singer and guitar player of the „Pátí na světě/Fifth in the World“ band. …is a member of „Messier Objects“ quartet (with Klaus Filip, Andrea Neumann, and Toshimaru Nakamura). The quartet released a concert CD on label Ftarri (JAP). …“writes“ a sound diary from all his journeys – collects excerpts of stories, weird sounds and various „acoustic mistakes“. …likes to take part in one-shot improvisational groups or duos (with Cremaster /E/, Ruth Barberán /E/ and Margarida Garcia /P/, Will Guthrie /Aus/, Andrea Neumann /D/, Klaus Filip /A/, Toshimaru Nakamura /JAP/…) as well as playing solo performances. Since 2005 his main interest has been to „dig out“ sounds from an amplified Dopleta 160 knitting machine from the 70s.